Five to six inches long. Steel blue-green crown becoming darker and shading into black on back, wings and forked tail. Snow white cheeks and undersides. Breeds throughout most of North America from California to northern Alaska across Canada throughout the Great Lakes region, New Brunswick, Nova Scotia, down the Atlantic seaboard as far as the Carolinas and somewhat less dense throughout the Mississippi Valley and upper plains. Sparse to none in the arid south. They catch flying insects in aerobatic maneuvers over fields, streams and wetlands where rich populations of flying insects spawn. They also eat fruit. 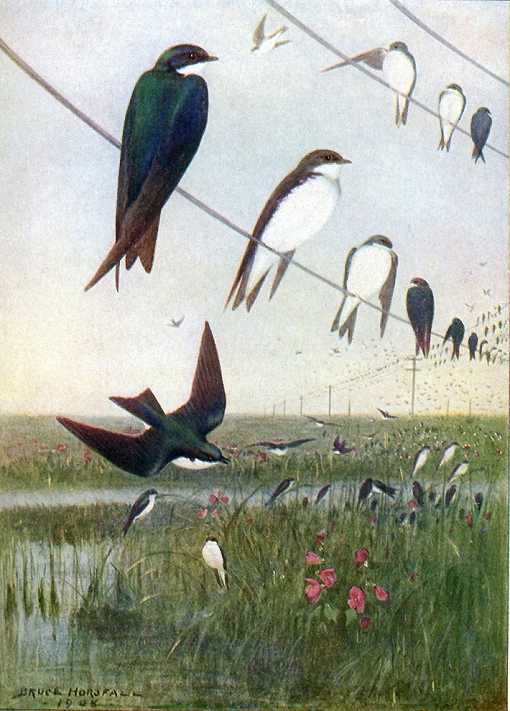 Build nests of grass and straw lined with feathers three to thirty feet high in natural or abandoned tree cavities and cliffs and very often in nest boxes in woodland edges, groves, farms and towns. Females lay about four to eight white eggs which hatch after about two weeks incubation and young leave the nest in about another three weeks. 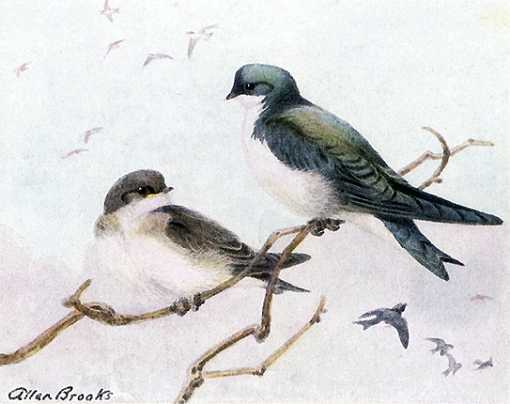 Often raise two broods per season. In late summer, they form huge flocks sailing over open country, feeding on insects and inhabiting marshes in the evenings before migration. They migrate to California and the gulf coast, Mexico, the Caribbean and Central America to Guatemala. Some return to the areas where they were raised and many reuse the same nest boxes. The Tree Swallow Birdhouse (same as for Violet Green Swallow), has a 5″ by 5″ floor, 8″ inside floor to ceiling, 1 1/2″ diameter entrance hole located 6″ above the floor and ventilation openings. Mount on a tree trunk or post, or hang from a tree branch or under an eave between four and twenty feet high with partial sun and shade. Place several boxes in a yard or field edge; they welcome neighbors. They also make great neighbors for bluebirds and help chase sparrows away. Remove the nest and clean the box after the brood rearing seasons are over. Sparrows, chickadees, titmice, nuthatches, downy woodpeckers and wrens may use this box.